Today is Thursday and do you know what that means? IT’S THROWBACK THURSDAY!! WOOP WOOP! 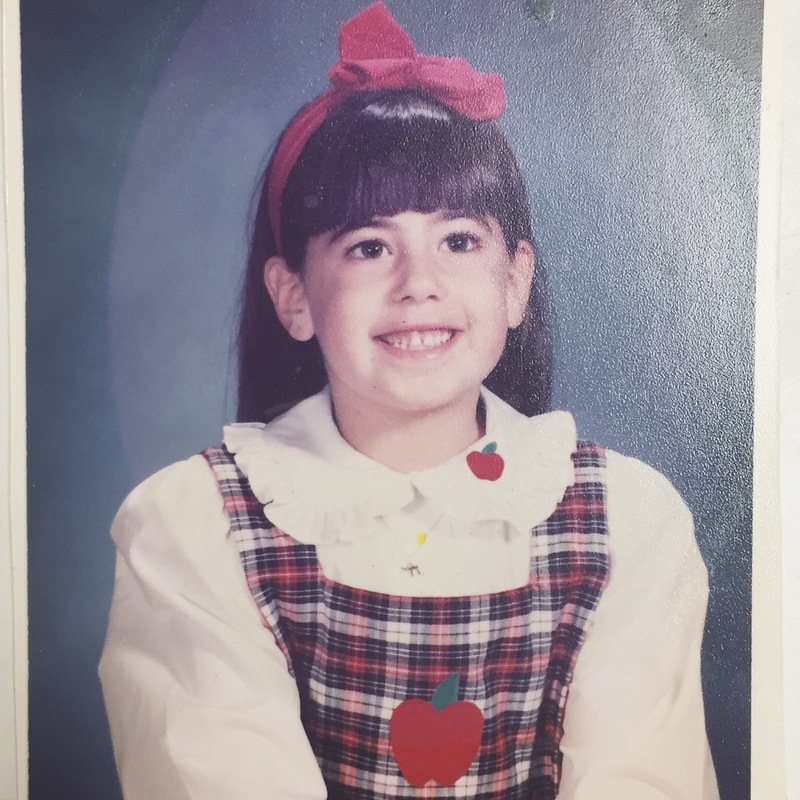 For This Thursday’s #TBT I present to you my precious *punim (major bangs and all) in either 3rd or 4th grade – on Class Picture Day!! First of all – looking past the mustard stain I got on my white blouse at lunch time (Who’s smart idea was it to have picture day after Lunch, anyway? Bad Idea!) look at that ensable I have on!! I mean, come on! It was literally my least favorite dress I owned but Mommy insisted I wear it for class picture day because – well there are a few reasons. Reason No. 1 – She loved it. Reason No 2. – She loved it. Reason No.3. – She loved it! Reason No. 4 – She thought it was very studious with the apple and all. Reason No. 5 – Mom thought it was the perfect little dress for the apple of her eye (after hearing my grandmother say the same thing). Reason No. 6 – Did I mention she loved it? It was fine. I secretly loved it too but only because the skirt part of the dress twirled out very far when I spun around. At that age and even today I measure my love for a dress for how far it will flair out when I spin around. True Story. I guess it just has something to do with my ballerina roots or always dreaming on being a princess after watching Rodger’s and Hammerstein’s “Cinderella” with Leslie Anne Warren. All of the gowns took my breath away! Even though I wasn’t the biggest fan of this dress, it was on this very day that I learned to defend myself in the fashion arena. I learned that I should stand up for myself and not allow anyone to make fun of me for what I was wearing because I would never do that to someone else. Being bullied for an outfit I was wearing was only small potatoes compared to some of the other bullying I received by one girl in my class but I knew at this very moment that it all stemmed from pure jealousy. Silly jealousy, that should not have even existed. I honestly didn’t even know how being jealous felt and tried to make myself at an early age understand the feeling, but this was very difficult. I was always one that was happy for someone if they had something, even if I didn’t have it or if I wanted it. If it made them happy, that’s all I cared about. So for me to have a few people knock my dress while they were in a sweatshirt and jeans made me realize that they too probably wished they were wearing a dress. Maybe even ones with bananas or grapes on them. As I sat to take this picture I heard little whisperes of unkind things being said which prompted me to feel more confident. I als0 realized that if someone had something unkind to say about me – they were just projecting what they felt about themselves on someone else, which was me. So, what did I do? I sat there in front of the camera pretending I was posing for the cover of a Girl’s Life Magazine and smiled the biggest most confident smile I could, without looking mental. When I got home and my mom asked me why I was rushing to take off my dress – I paused and said to myself – “This is silly, I gotta twirl around one last 100 times before I take this baby off!” and that’s what I did. Then I told my mom what happened in school and about the mustard stain from lunch which was not as a big of a deal as I thought it was going to be because….dry cleaning! So, that’s most of the story behind this picture. It’s amazing what our minds will remember, isn’t it? Do you have a funny picture day story? I’d love to hear about it! Shoot me a comment below and follow me on all social media account for more daily fun!